What do these 3 trees and their issues have in common? They are all in stress. 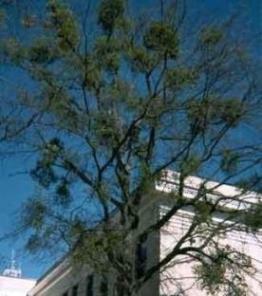 The sapsucker bird damage, mistletoe infestation and heavy gall formation do not happen severely except on stressed trees. The solution? The Sick Tree Treatment. The details keep being amended and improved. Here is the latest version. Toxic chemical pesticides kill beneficial nematodes, other helpful microbes, good insects, and also control the pest insects poorly. Synthetic fertilizers are unbalanced, harsh, high in salt, often contaminated and destructive to the chemistry, the physics and the life in the soil. They also feed plants poorly and contaminate the environment. A very high percentage of trees are too deep in their containers and also have been planted too low or have had fill soil or eroded soil added on top of the root flares. Soil on top of the root flare reduces oxygen availability and leads to circling and girdling roots. 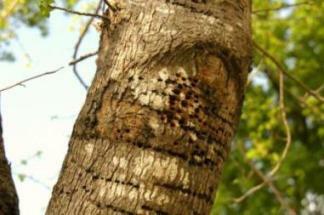 Soil, or even heavy mulch on trunks, keeps the bark constantly moist which can rot or girdle trees. Ideally, excess soil and circling and girdling roots should be removed before planting. Removing soil from the root flares of existing trees should be done professionally with a tool called the Air Spade. Homeowners can do the work by hand with a stiff broom or brush. Gentle water and a shop-vac can be used if done very carefully. Vines and ground covers should also be kept off tree trunks. They should actually be pruned back away from the flares, at least on an annual basis. Don’t rip, till or plow the soil. That destroys all the feeder roots. Punch holes (with turning forks, core aerators or agriculture devices such as the Air-Way) heavily throughout the root zone. Liquid injectors and the Air Spade can also be used. Start between the drip line and the trunk and go far out beyond the drip line. Holes 6-8" deep are ideal, but any depth is beneficial. Apply zeolite 40-80 lbs. per 1000 sq. ft., greensand at about 40-80 lbs. per 1,000 sq. ft., lava sand at about 80-120 lbs. per 1,000 sq. ft., horticultural cornmeal at about 20-30 lbs. per 1,000 sq. ft. and dry molasses at about 10-20 lbs. per 1,000 sq. ft. Cornmeal is a natural disease fighter and molasses is a carbohydrate source to feed the microbes in the soil. Expanded shale applied at 1/2 " is also very helpful if the budget allows this step. Apply a 1" layer of compost followed by a 3" layer of shredded native tree trimmings; however, do not pile mulch up on the root flare or the trunk. Smaller amounts of these materials can be used where budget restrictions exist. Also, any rock dust material different than the base rock on the site will help. 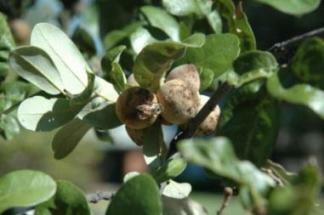 Spray the ground, trunks, limbs, twigs and foliage of trees with compost tea or the entire Garrett Juice mixture. Do this monthly or more often if possible. Drench the root zone with Garrett Juice plus Bio S.I. microbe product containing bacteria and mycorrhizal fungi. For large-scale farms and ranches, a one-time spraying is beneficial if the budget doesn’t allow ongoing sprays. Adding garlic oil tea or cornmeal juice to the spray is also beneficial for disease control while the tree is in trouble. Cornmeal Juice is a natural fungal control that is made by soaking horticultural or whole ground cornmeal in water at 1 cup per 5 gallons of water. Screen out the solids and spray without further dilution. Cornmeal Juice can be mixed with compost tea, Garrett Juice or any other natural foliar feeding spray. It can also be used as a soil drench for the control of soil borne diseases. Dry granulated garlic can also be used on the soil in the root zone at about 1-2 lbs. per 1000 sq. ft. for additional disease control. Adding Bio Wash to the spray is also helpful against insect pests and disease pathogens. During drought conditions, adding soil moisture is a critical component.